Explanation: This cosmic close-up looks deep inside the Soul Nebula. The dark and brooding dust clouds outlined by bright ridges of glowing gas are cataloged as IC 1871. About 25 light-years across, the telescopic field of view spans only a small part of the much larger Heart and Soul nebulae. At an estimated distance of 6,500 light-years the star-forming complex lies within the Perseus spiral arm of the Milky Way, seen in planet Earth's skies toward the constellation Cassiopeia. 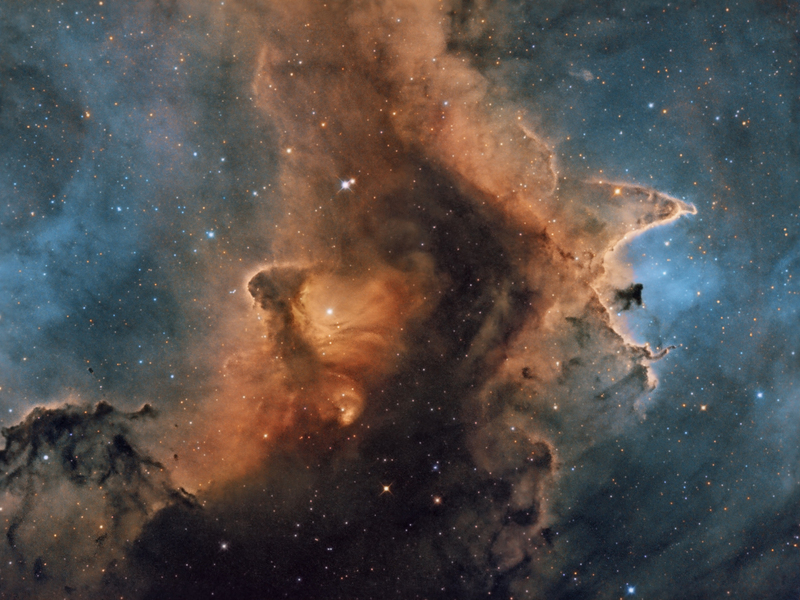 An example of triggered star formation, the dense star-forming clouds of IC 1871 are themselves sculpted by the intense winds and radiation of the region's massive young stars. This color image adopts a palette made popular in Hubble images of star-forming regions.